Imagine this car with a less dramatic styling kit and smaller wheels and you'd be looking at Alfa Romeo's first new company car offering since the Giulietta in 2010. 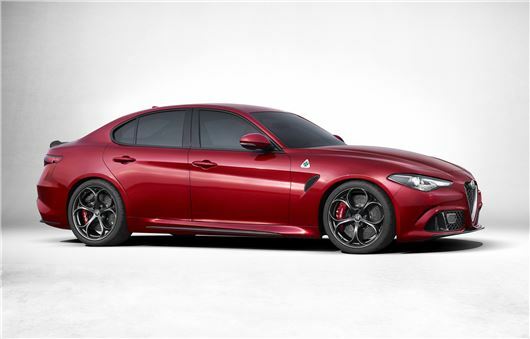 Alfa Romeo’s new Giulia will be taking the manufacturer into the sector of the market traditionally associated with company cars in 2016. The model unveiled this month comes with a 510PS turbocharged 3.0-litre V6 petrol engine, but it will be the four-cylinder petrol will be important to boost its presence in the UK. The Giulia will go up against the BMW 3 Series, new Audi A4, Mercedes-Benz C-Class and Jaguar XE, so we can expect diesel versions to be competitive on CO2 emissions and offer variants with less than 100g/km. Few other details are available, although Alfa Romeo has confirmed the rear-wheel drive Giulia will have 50:50 front to rear weight distribution, for optimised balance, as well as double wishbone front suspension (like the Jaguar XE) for strong handling characteristics. Alfa Romeo has been undergoing a restructuring in the UK as part of the Fiat Chrysler Automobiles group, where it is seen as an upmarket and sporty brand thanks to its heritage in motor sports and Grand Prix racing. In the UK is has survived on a two-model line-up for a few years following the discontinuation of the Giulia’s predecessor, the Alfa Romeo 159. Alfa dealers will often be seen as Alfa Romeo and Jeep outlets in the UK. Last Year, Alfa introduced the high-performance 4C sports car last year, and plans to introduce two SUV models and a large saloon over the next three years. The range is expected to start at somewhere around £25,000-£30,000.